The Town of Los Altos Hills was incorporated on January 27, 1956. Before then, residential development was constrained by numerous factors, including lack of a dependable water supply. Water from wells and creek beds was safe but not always adequate. 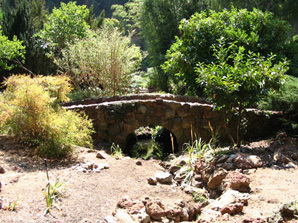 Headwaters for Hale, Adobe, Barron, Matadero, Purissima, and Deer Creeks are generated in local foothills with heavily wooded banks and often impenetrable areas of poison oak and chaparral. Homes and farms were usually on large acreage. The region's personality was distinctly rural. In 1956, the many advocates for incorporating the city as "The Town of Los Altos Hills" were singularly dedicated to "preservation of the rural atmosphere of the foothills." Stonebrook Court and Griffin House are official Town Historical Landmarks. Please click the links below for the Stonebrook Court presentation. Lantarnam Hall, named after the town of Llantarnam, Wales, was designed by Bay Area architect John Powers for Percy Morgan, descended from Welsh immigrants, and his wife Daisy, and completed in 1916. Furnished with European art objects and furniture, the house was patterned after Speke Hall, Lancashire, England. Subsequent owners included restaurateurs, Depression-era cleric Father Divine, and - almost - madam Belle Silver, whose check for the $200,000 purchase was no good. In 1952 John Carter Ford bought the house and renovated it for a day school. It reverted to private ownership in 1988. The Lantarnam Hall, operated for many years as Ford Country Day School. This was the home of Willard Griffin, a founder of Del Monte Packing. The brown-shingled house, situated near the entrance of Foothill College, was bought for the college in the late 1950s. Friends of Griffin House have offered to work with the District to develop a viable plan that meets the Districts facilities requirements as well as its financial constraints. What happens next may be influenced by the community. Please click here for Part 1 of Adobe Creek Lodge Story by historian John Ralston. Please click here for Part 2 of Adobe Creek Lodge Story by historian John Ralston. 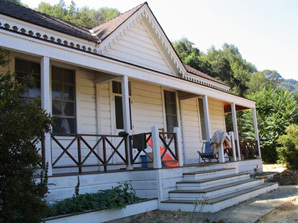 Adobe Creek Lodge, an English country-style mansion, was built by Consolidated Chemicals vice-president Milton Haas in 1935. It was a destination resort in the 1940s. Vacationers could stay for a day, and hold weddings and picnics. Bandleaders Jimmy Dorsey and Harry James played here under the stars. The property went from a private to a commercial resort and then to a private club. The former restaurant building is a guesthouse today. In 1924 Frank and Joseph Duveneck established Hidden Villa on 1,600 acres of open space in the Los Altos Hills. The property now sponsors environmental and educational programs, a multicultural summer camp, a hostel, a communal garden, and day-use visits. The White House, at Hidden Villa, now a private residence for interns, dates from the 1860's, when it was built as a stagecoach stop and inn. The former Duveneck house has been restored and includes some original artifacts forged by Frank Duveneck himself.